Quick early evening visit to see Bruno Curassier at Domaine de la Grange in Bléré to taste his 2008s. Fortunately we managed to squeeze a time between Bruno’s English lesson and him getting ready to drive to Paris very early the next day to deliver wine. Bruno’s history illustrates the problems now facing some of the local co-operatives. Until 2003 he was a full member of the S.C.A Cellier du Beaujardin in Bléré. That year he started to vinify and to gradually pull out of Beaujardin. In 2003 he made 50 hls. This doubled the following year and in 2006 Bruno made 350 hls and started to equip himself properly. “I said goodbye to the coop in 2006.” He pulled out 8 hectares of vines and kept 14. The coops are facing losing some of their younger members, who like Bruno want to set up on their own, and their older members, who are ready to retire and accept the subsidy for pulling up their vines. As yet Bruno doesn’t export, though he is looking to develop markets outside France. Most of Bruno’s sales are to individuals including tourists passing through the Cher Valley during the season. So far sales are going well. Bruno: “All my 2007 Sauvignon Blanc and Rosé are sold out and I just have a little red left. However, I need to spread the risk and develop other markets. It is dangerous to have all your eggs in the same basket.” For the first time he will have a stand at the Salon des Vins de Loire at the beginning of February. 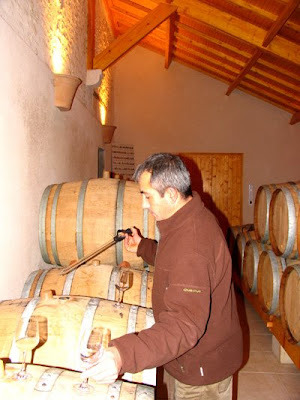 Unlike many Loire vignerons Bruno had his normal yield in 2008 – averaging 55 hl/ha. Bruno: “Apart from picking some Chardonnay to make sparkling wine, the main harvest really started on 10th October and we finished on 25th. 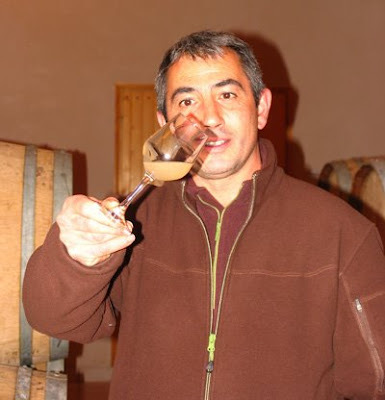 The last grapes to be picked were the Chenin, which came in at 15.5 and is currently slowly fermenting in barrel. We started with the 2008 Sauvignon Blanc Les Buissonets, which was bottled last Friday. 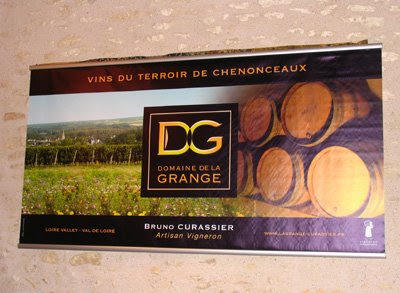 This is the only 2008 from Domaine de la Grange that is finished and is just a small bottling, so he has something to sell over Christmas. It was also the first finished 2008 that I have tasted. Initially quite ripe and rich, it is tight in the finished – hardly surprising as it was only bottled three days ago. Les Buissonets has 14˚ of alcohol, 4.5 gms acidity and 5 gms of residual sugar to round it out. The rest of the wines were ‘brut de cuve’. Naturally they may well change considerably before they are bottled, so my comments should be read in that light. These are wines in progress. Next up a very pretty Touraine Rosé made from 100% Grolleau, which will be bottled in January. It should make a very attractive drink if we have a good spring and summer. Then a soft and reasonably concentrated Gamay. Followed by a deep coloured Cabernet Franc, which is yet to go through its malolactic. So, too, the Côt (Malbec) that was just starting its malo. Both wines have good structure and are encouraging approachable despite lacking the softening effect of the malo. The last red was another Cabernet Franc that was picked on 21st October and spent 45 days on the marc (skins and pips etc.). This is a lot more tannic than the other Cabernet Franc. I fancy it will need a far while to soften. We finished with a taste of the fermenting Chenin – still at the appley Bernache stage.